Today we are very proud to announce our biggest change in almost two years: it's a new service called Team CI Pro. You're trying to improve software quality. You implement continuous integration. You're lucky, you have a motivated team that rarely breaks the build and religiously fixes breaks. If this is you, Siren of Shame probably adds a some fun around the office, but is mostly a toy. In this case you likely don't need most of what Team CI Pro offers (skip to Curl to Siren, below). If you're like the rest of us your team or program breaks the build with some regularity, fails to fix it quickly, requires nagging, and/or avoids fixing builds when someone else caused the break. If this is you, our new Team CI Pro service will provide the extra motivation your team needs to realize the full potential of continuous integration. But why a new service? Today, at little to no cost, you can increase build awareness by throwing builds up on a dedicated monitor with our free desktop app and full-screen feature. You can light up a siren when the build breaks. You can require that everyone download desktop clients to get the motivating stats and gamification information. You could even mandate that everyone sign up for My CI to get build information, stats, and gamification information pushed to their e-mail and phones for free. But what if you don't have the authority to require your team members do anything? How do you deal with team members less passionate about CI, and far less likely to install another app, than you? And what if you have a distributed team that can't all see the siren or the dedicated monitor? Even if you could mandate desktop clients and My CI for all, there's a bigger problem. If a desktop client instance is turned off it can get out of sync. For instance when developer #1 goes on vacation for a week, their client misses a week's worth of reputation changes and achievements from their team mates. It's hard to brag about your superior reputation or "Consecutive Successful Build (FSB)" score when everyone has different numbers. 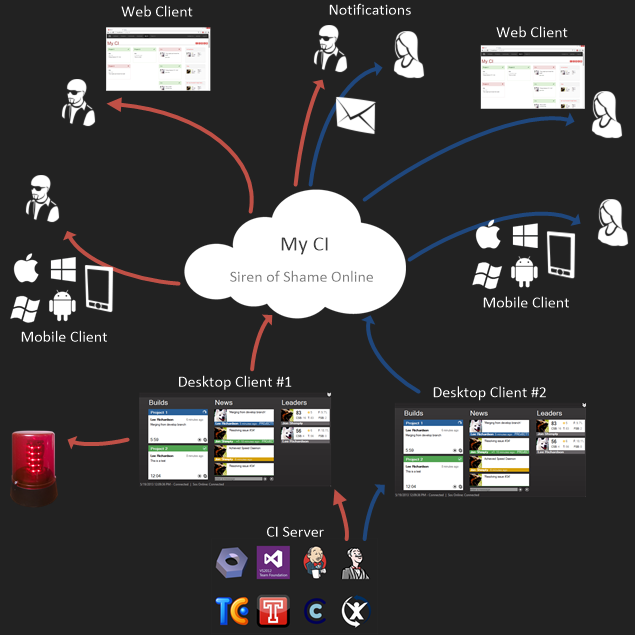 Team CI Pro inherently addresses these problems with an architecture designed around a single instance of the desktop client. Continuous integration data flows in from the CI server (bottom right) through a single desktop client (and maybe fewer, see A Shameful Future below for details) into Siren of Shame Online. The desktop client sync's its stats and achievements to SoS Online, where the information is distributed to team members through a variety of mediums. 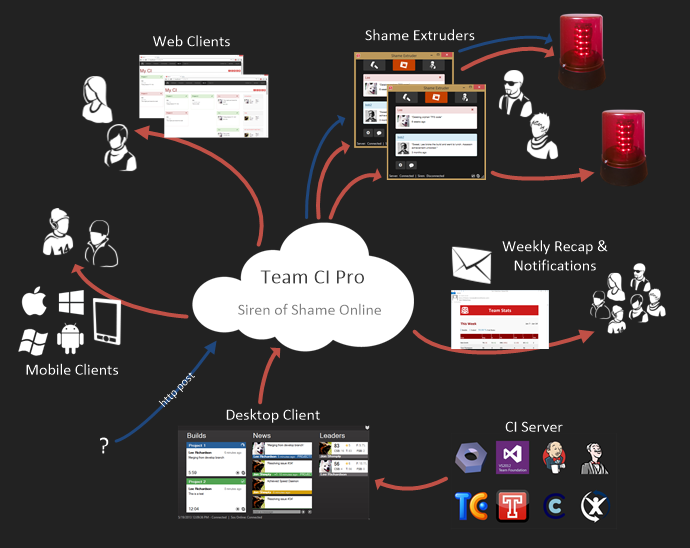 To facilitate distributing information to team members, teams maintain a single Team CI Pro master account on Siren of Shame Online. 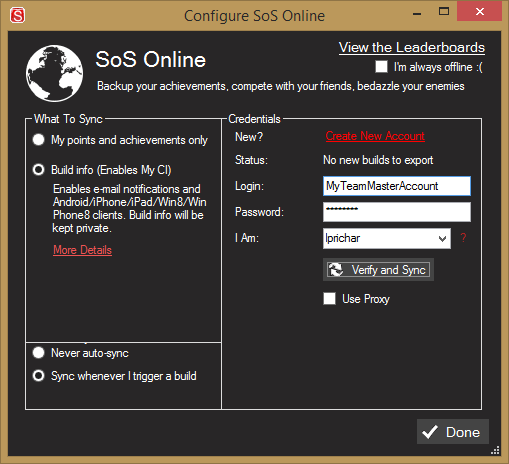 Desktop clients sync to the master account in the SoS Online menu as if they were doing My CI. Once that master account has signed up for Team CI Pro (via the 'start free trial' button at of the Team CI Page) it can access a configuration page where it can add team member accounts that will receive the master account's data. Team members added to the configuration page gain access to a number of cool new features. #protip - Syncing to a team master account and adding yourself as a team member allows your team to continue with Team CI Pro in the event you ever leave the team. 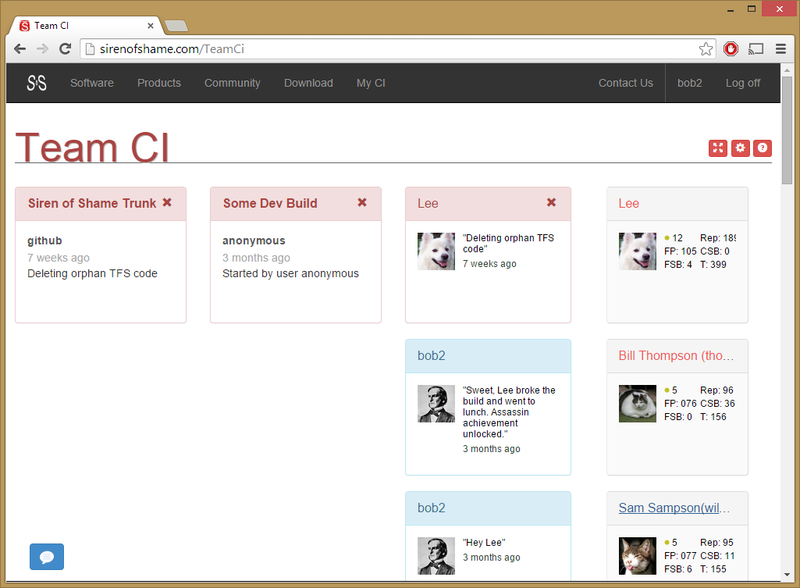 While the web client isn't new, Team CI Pro adds some new features. Team members will get a new chart at the bottom of their Team CI page so they can see reputation over time. Team Members will also get the ability to chat (via the blue floating button in the bottom left). Chat messages are sent as news items to Shame Extruders (see below), mobile clients, and other web clients in realtime so team members can taunt, brag, heckle, or worst case discuss actual work. All web clients now get a new full screen view (via the leftmost red button in the screenshot above). The page is fully responsive and is designed to look good at tiny phone resolutions as well as large, high-dpi displays. The full screen page could easily replace the full screen view in the desktop client and teams could throw identical build data up on multiple information radiators around the office, or around multiple distributed offices. Just hit F11 (or Command+Control+F). The Android, iOS, Win Phone, and Windows Store mobile clients today show your build information, your placement and stats among a large list of virtual strangers on the SoS Online Leaderboard, and a list of news items that mostly don't relate to you or your team. Members of Team CI Pro will immediately have news items replaced with only news items relevant to your project (build events, achievements of fellow team members, and chat messages). 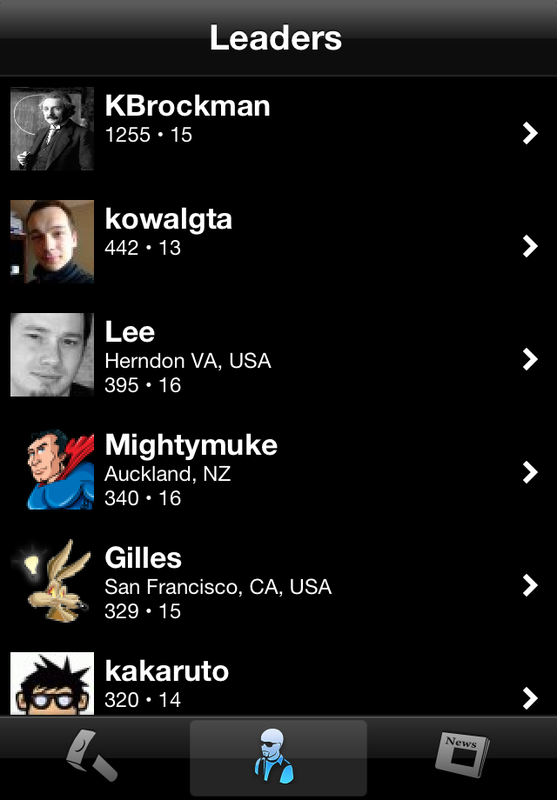 Team CI Pro members will also see their placement and stats among just their team members. The end result is the data displayed will be more meaningful and engaging. And of course Team CI Pro members will continue to receive push notifications about build events and badge updates with the number of currently broken builds just like they did with My CI. A very exciting new feature for Team CI Pro members are Shame Extruders. Shame Extruders are lightweight desktop clients that give team members all the benefits of desktop clients without any of the polling (updates are sent via SignalR). While nice for individuals Shame Extruders make it even easier to install multiple sirens in different rooms or at different locations around an office with a large or distributed team. My CI sent team leads e-mails when achievements were unlocked or builds broken (including stats like highest CSB attained). Team CI extends these features by sending e-mails directly to appropriate team members. 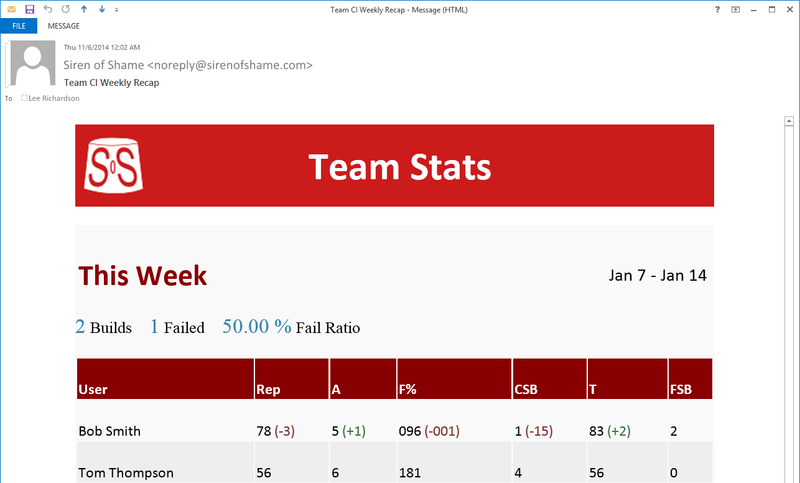 Better yet it provides a weekly recap e-mail with overall pass/fail ratio and a summary of team members standings and delta's to help maintain the team's continued focus on quality. We're extremely excited by the potential of this last feature. 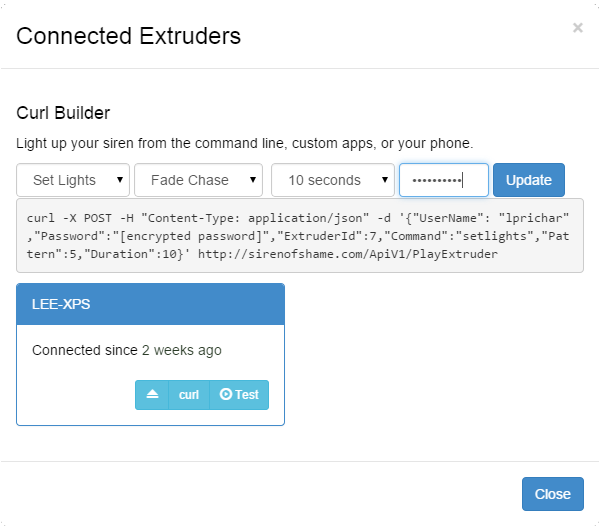 Curl to Siren allows the master account to light up any siren in their network that's connected via a shame extruder by hitting a REST based URL. To make it work fire up a Shame Extruder, log on as the team owner account or a team member, and connect a USB siren. Now navigate to the master account's My CI page. The red button furthest left should have a badge with the number of Extruder's connected. When you click you can select "test" to fire a quick default audio and led pattern. Or if you click the "curl" button you'll be presented with a CURL builder that will allow you to build the exact command you can run from the command line on any computer in the world to light up that siren. 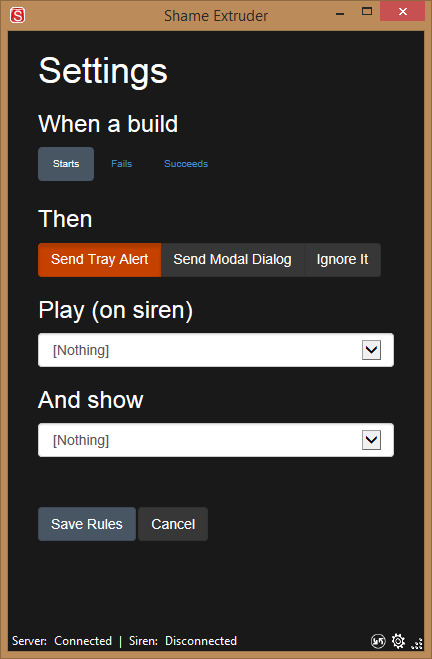 This feature should enable you to integrate sirens into all kinds of things. Stock ticker watchers, e-mail notifiers, room busy indicators, train schedules, or ifttt. We can't wait to hear what you come up with. Pricing starts as low as $10 per month for small teams. Check out our pricing page for more details. Or better yet try it out at no cost for a month. It's one click to get started. No credit cards, or DNA samples required. Shame Extruder for Mac - Right now the Shame Extruders are for Windows clients only. Vote for this option if you use a Mac and like Team CI Pro, but the web and mobile options aren't cutting it. Team CI On Premise - Behind a firewall but still want all that Team CI Pro goodness? Bluetooth Controlled Power Plug - For integrating lava lamps, model trains, or other on/off items into your CI pipeline. This is actually prototyped out and just about ready to go. Shame Whisperer - Wouldn't it be great to cut out polling and the Desktop Client all together? 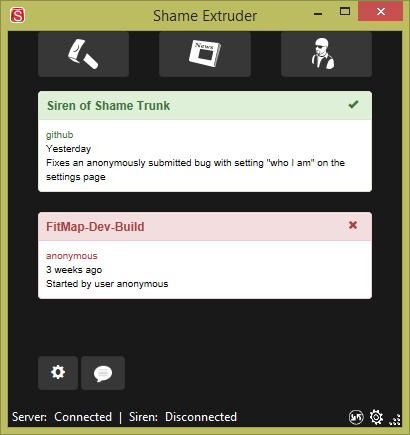 Shame Whisperers are Plugins to CI servers that send data up to Siren of Shame Online. Productized Raspberry Pi - You can hook your siren up to a Raspberry Pi today with some fiddling. Wouldn't it be great if you could buy a pre-configured Raspberry Pi or download an image to turn your siren into an IoT device with virtually no effort? Even cooler with curl to siren. Full Desktop Client for Mac - This is expensive and time consuming, but if a Shame Extruder and/or a Shame Whisperer isn't right for you we're ready to start work on a native Mac client today. Slack Integration - If you use Slack and want your gamification data integrated vote for this. What Else? - There's a write in option. Please submit any other great ideas, we'd love to hear them all. We've put a lot into these features and hope you love them. We hope you'll check out the free trial. We've also got some exciting plans for what's next, and we hope you'll help us choose our next direction. As always please let us know what you think in the comments, on twitter, facebook, or google+.